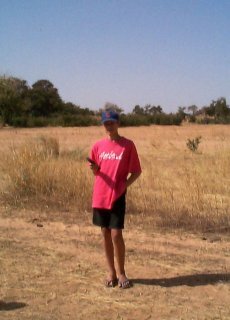 16-Feb-2001 -- After learning about the Degree Confluence Project from a friend here in Burkina Faso, my son, David, and I decided to go out and find one. So, looking at a map of Burkina Faso we noticed that the confluence point 14N 1W was the closest one to where we live. From our house, the GPS read about 37 kilometers, that being southeast of where we live. We took the only major dirt road that goes east in our area for about 16 kilometers. Then we proceeded south on a secondary dirt road for about 15 kilometers until we reached the village of Tauoremba. At this point, we were more or less at 14°N, now we needed to go east. We found the only road (if you can call it a road) that led out of the village of Taouremba going east towards the village of Gasseliki. David and I figured that our destination would be somewhere west of this village. With our GPS in hand we started east. After about an hour and several stops asking villagers if this path we were traveling was indeed the one that would take us to Gasseliki, we arrived in the village of Pelesambo. It was at this point, as we were about to leave this village, that we reached and passed 1°W. We turned our truck around, went back a bit and parked under a shade tree. We were at 1°W and perhaps 400 meters south of 14°N. As we started our trek north we were joined by some of the men from this village who came out to see what we were doing and decided to accompany us to our final and exact location of 14°N 1°W. I'm not sure what the men in Pelesambo thought we were doing. We tried to explain our objective to them, but I’m afraid it is still somewhat of a mystery to them. #1: David at 14°N 1°W in the village of Pelesambo. #2: David with some of the men of Pelesambo at the confluence point.